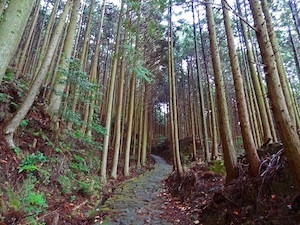 Hidden deep within the Kii Peninsula of Japan lies a series of ancient pilgrim paths known collectively as the Kumano Kodo, or the Kumano Old Road. These mountain paths date back to the tenth century and link the cities of Kyoto, Osaka, Tanabe, and Wakayama to three sacred shrines. The benefits of undertaking this pilgrimage are threefold. You get to escape the beaten tourist track and slow down to a pace where you can really appreciate the magnificent scenery surrounding you. You get to immerse yourself in the traditional Japanese way of life, including how they sleep, eat, and bathe. You get to take part in something much bigger than yourself, a sense of achievement that comes from successfully completing your very own pilgrimage, whatever your motives, as others did so many hundreds of years ago. We started our adventure by taking the train from Kyoto to Tanabe. Near the train station there is an excellent tourist information office where they stock a multitude of maps and brochures on the Kumano Kodo and will answer all of your questions in perfect English. We stopped here to have lunch before catching a local bus to our pilgrimage starting point, a small town called Takajiri. 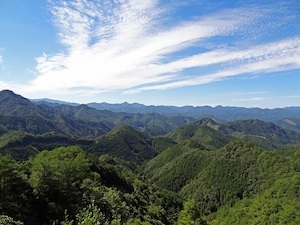 Our five-day pilgrimage took us 50 miles along the Nakahechi route, through remote mountain paths and forests, past innumerable oji shrines, and most importantly to two of the Kumano Grand Shrines — Hongu Taisha and Nachi Taisha. The pilgrimage is a test of fitness and endurance, with many long lung-cleansing inclines, followed by steep and slippery joint-jolting descents. The scenery throughout the whole trail is breathtaking — from pristine mountain vistas to misty wooded forests, bamboo groves, and lush river valleys. We stayed in five quaint traditional villages along the Nakahechi route, where our hosts welcomed us into their homes like long-lost friends. Our dinner each evening was a gastronomical delight, with every meal freshly cooked by our hosts and consisting of pickles, noodle soups, fried fish, tempura seafood and vegetables, sashimi, and sticky rice. We washed down all this wholesome food with delicious local sake. Each guesthouse had a traditional communal Japanese onsen for bathing. An onsen is a hot spring mineral bath, which is believed to have healing properties. Soaking in a lovely hot bath is the perfect end to a tough day of hiking and a great remedy for aching muscles. Each night we stayed in tatami mat rooms and pulled our futon mattresses out of the closet to convert our living room to a bedroom. We would leave the window open to enjoy the cool mountain breeze throughout the night, and slept the wonderful deep sleep of those who have earned it. 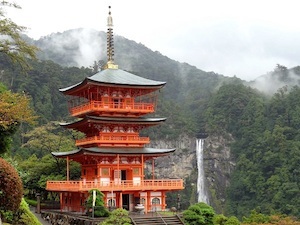 Our pilgrimage came to an end at the Grand Shrine of Nachi Taisha, which is located in an attractive little tourist town called Nachi-san and which is also home to the sacred Nachi-taki waterfall. Here we participated in a communal dinner with other pilgrims and shared stories of our experiences on the Kumano Kodo. We all agreed; it had been a tough but highly rewarding experience.